Clinics, schools and gyms can use this physical therapist job description to advertise the responsibilities and qualifications required for the position. Exam, assess and evaluate patients. Determine a specific plan for each patient, and ensure it is accomplished. Engage in specific activities, including those that improve a patient's strength, flexibility, and range of motion. Work in conjunction with doctors when necessary. Be flexible in working with patients, and willing to listen to their needs and concerns. 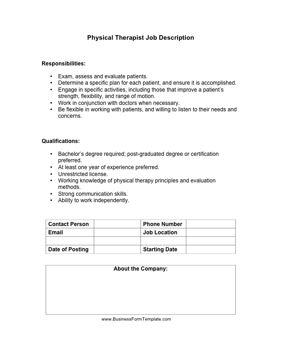 Bachelor's degree required; post-graduated degree or certification preferred. Working knowledge of physical therapy principles and evaluation methods.